The Amish Lincoln Mission Executive Desk has a modern Mission look. Simple yet distinguished, refined yet hardworking, this executive desk takes center stage in your office with quiet strength and solid features. The difference in an Amish made desk versus desks made of lesser materials shows in the way it functions, feels and looks. Details like dovetailed drawers on full extension slides offer unending support for desk contents and truly make a difference in the long run. The solid wood holds up to the demands of daily office work while showing off the quality and beauty of the wood grain. 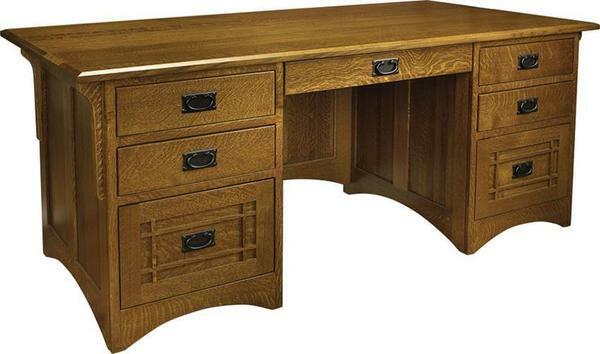 The Lincoln Mission Executive Desk is available in either a 66" or 72" width to best fit your space. Comes complete with two hanging file drawers, four storage drawers and a central pencil drawer. Cord grommets accommodate computer equipment while keeping connections neat and tidy. The Lincoln is shown here in quarter sawn white oak wood with Michael's cherry finish. Quarter sawn white oak displays unique flakes and markings in the wood that come from the unique way the oak log is cut. Quarter sawn white oak is known for its strength and firm texture. This solid wood desk is simple mission style, pure and functional with no frills, allowing the beauty of the solid wood to shine. Your choice of wood, stain and hardware. We offer stain matching so you can easily add the Lincoln to your existing office furniture. Order stain samples to work with from our collection. Investing in office furniture that will last pays off long term. Enjoy our blog post, Desks for the Busy Professional for a look at desk types for all kinds of office needs. Email or call one of our Amish Furniture Specialists with any questions to be sure we have the instructions to create the desk you want. We can be reached toll-free at 866-272-6773.